As the time change provides us all with more daylight in which to enjoy the great outdoors, I wanted to give you an update about much that is happening in our City. 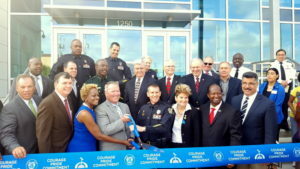 Last month we celebrated the historic opening of our new state-of-the-art, 96,000 square foot Orlando Police Headquarters located on South Street in the Parramore Neighborhood. 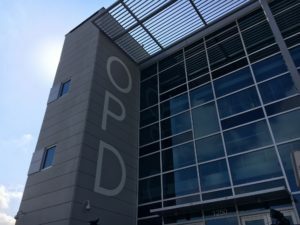 The building itself is designed to provide new ways to interact and continue to build relationships between the department and the community while enhancing operations to further protect residents, businesses and visitors. There are multiple amenities, both inside and outside the headquarter building, including a 5,000 square-foot multi-purpose room dedicated for community events and meetings; easier access to public parking; and more parking spaces for visitors, including two new “online exchange” parking spaces which allow online buyers and sellers a safe place to exchange goods and payment. There is also an outdoor public plaza which includes a beautiful art piece entitled, Wings of Protection, by artist Linda Howard. The lobby is much more open and there is ADA accessibility on all sides of the building. Most importantly, the new facility is home to 760 sworn officers and more than 230 civilian personnel who work tirelessly every day to not only keep us safe, but to make our community a better place. Please come and see this great new space for yourself and meet many of our officers at the community open house taking place on Saturday, April 15th from 11 a.m. to 2 p.m.
Also on April 15,th at 9:30 a.m. Mayor Dyer, Commissioner Sheehan, and Commissioner Stuart will join the community for a ribbon cutting of the new multi-use path that was constructed as part of the Bumby Avenue public works project. The ribbon cutting will take place on the path at North Bumby Avenue and Oregon Street. We encourage you to join us at this location on your bikes (or on your own two feet) and travel with us along the path to the Audubon Park Garden District. If you plan to drive to this event, please park at Lake Druid Park and bike with the mayor and commissioners to the ribbon-cutting location. Juice Bike Share bikes will be available on a first-come-first-served basis at Lake Druid Park. The opening of the new path and the reopening of Bumby Avenue marks an exciting time as the City continues to make investments in our infrastructure and enhance the safety of our cyclists and pedestrians. The scope of the North Bumby Avenue Improvement Project was significant and included reconstructing the road, installing a new stormwater collection system to improve drainage and reduce flooding, planting more than 125 trees, constructing a new 10-foot wide multi-use path, adding new sidewalks and crosswalks, enhancing pedestrian signals with audible countdowns, installing new bike repair stations and wayfinding signage, plus expanding our trail system to connect our Orlando Urban Trail to the Cady Way Trail. Thank you for your patience and cooperation throughout what I know was a long and, at times, frustrating project for area residents. I hope to see you on April 15 so we can celebrate this new community amenity. From Bumby, we move to Corrine Drive where MetroPlan Orlando is leading an independent evaluation and study of the corridor, which will lead to the creation of a vision plan that will be presented to all the adjacent local governments, which include Orange County, who owns this stretch of road; the City of Orlando, who maintains it; and the City of Winter Park, adjacent to much of it. The study, which includes a comprehensive community outreach plan, is expected to continue for about 18 months, through Spring 2018. While the study will include much technical work and data analysis by MetroPlan, community input is integral to the study. With that in mind, please visit their webpage, corrinedrivestudy.org; follow them on Twitter @MetroPlan_Orl; or if you are part of a group, invite the study partners to present at one of your meetings. Many of you may have read the Orlando Sentinel article last month about the expansion of the City’s Solid Waste Weekly Collection Pilot Program. Baldwin Park was already one of the neighborhoods in the pilot, which meant they received recycling pick up once a week rather than every other week, and garbage pick-up once a week rather than twice a week. 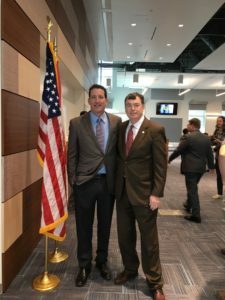 In order to get all of the information, I encourage you to watch the March 20th City Council Workshop, presented by Mike Carroll, the director of Solid Waste Management for the City of Orlando. It’s a great presentation and provides background information on this entire process. I welcome your thoughts as we continue to evaluate this pilot program. Please write me at robert.stuart@cityoforlando.net with your comments. Thanks for your continued support of our community and our vision of living life to the fullest in our Great City. I look forward to seeing you around town enjoying all of our great amenities this month.